Finally! This track has hit me strong when I was listening debut album by Alpha Steppa. Brazilian singer I-Sarana with her majestic vocal and lyrics on a wonderful, rich riddim with blazing horns. 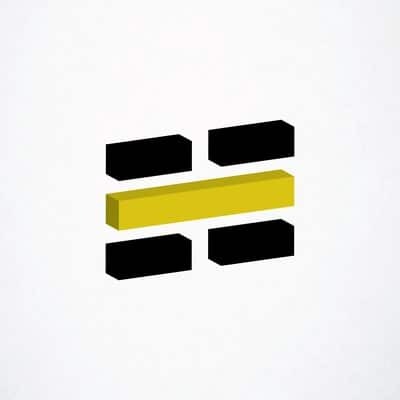 On the release we have previously unreleased versions and additional two heavyweight remixes by Sao Paulo’s High Public Sound. Tune! Dub Dynasty, combined forces of Alpha Steppa and Alpha&Omega, returns with the third album full of music – on their double LP we have 16 tracks and digital versions contain bonuses. What can we expect from the dub family this time? Let’s start from guests, because there is a lot of them. We have Cologne, who fits in with solid riddims very well, but we’ve already heard this on “Rooted & Grounded”; we have Steppas Records veteran Ras Tinny. Woman voices are represented by Kiangana and Sista Jane Warriah. The list is finished by Iyano Iyanti and Violinbwoy. Cologne has taken my liking on “Rooted & Grounded”, here again he sounds excellent on steppers riddims perfectly suited for a soundsystem session; the same thing is with tunes with Ras Tinny. Epic moment with Blackboard Jungle & Little Omara skanking on the stage!!! International Dub Gathering is a must!!! The basslines traditionally performs a massage of listener’s guts during loud listening, but what has entranced me the most is diversity, glued with this dark, mythical, hypnotic aura. Like from a magical forest, full of elves with their fabulous instruments and suspicious mushrooms, letting you connect with spirits…Besides, in many tunes we hear twittering birds – check “Footsteps” or “Holy Cow”. And if we’re talking about this title track, a cow story – the title sanctifying these animals can be understood in many ways; the cow was and is an object of worship in a lot of religions. 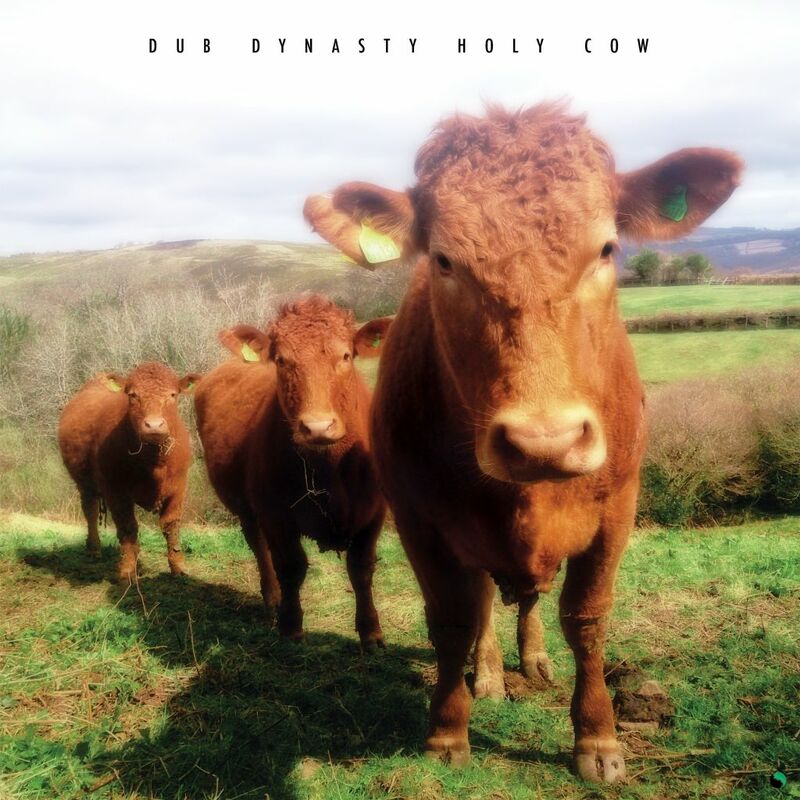 In the context of civilisation she can be our warning, how negative impact on the environment we make by factory farming and how human beings could sink to such depths, if we look to cruel practices of this procedure – “gentle” details of animal treatment you can find on Compassion In World Farming. 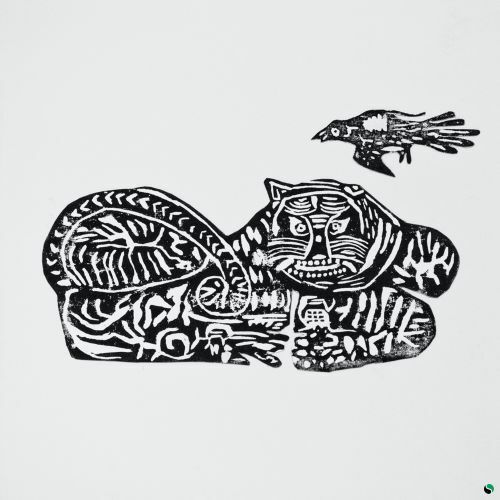 To summarize – Dub Dynasty feels very well, is close to nature and still works on mastership in dub and wizardry. Alpha Steppa presents the 5th one from the Trigram series and I have to admit, that it’s the most beautiful one. 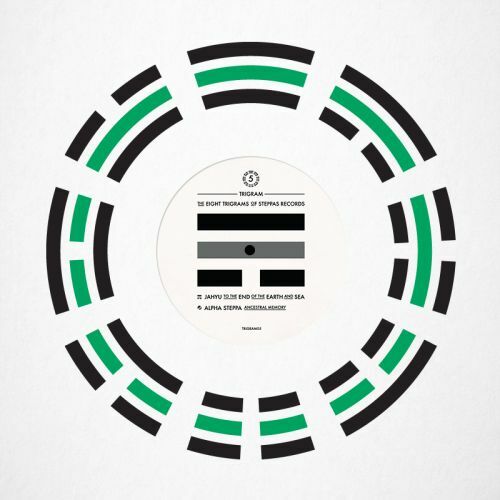 On the A side of this release we hear JahYu, known from other records for Steppas Records. The track “To the End of the Earth and Sea” is stunning, tribal, hypnotizing bass music with oriental flute and string melodies. It’s like a journey to a unreal land from a dream, hidden deeply somewhere at the end of the civilization. The B side blends perfectly into this vibe, because Alpha Steppa’s music also creates majestic, beautiful atmosphere filled by bass and etno-flavoured melodies. Wonderful disconnection from the present, so needed sometimes. When I first saw the info about this album I thought – it’s gonna be really good. Why? Because all the previous releases of Alpha Steppa were introducing me into this feeling, especially the last LP by Dub Dynasty. “Rooted & Grounded” is Ben’s first full solo album and it did it well. After the first sounds of “Catharsis” with Chazbo I had a feeling of vibe, which I know from many sound system sessions. The title “Rooted” for the first part is very accurate, because it has this beautiful rootical flavour – just check “Mix Up Fix Up” with Prince Jamo or “Teachings” with Sis Awa, so nice sound! Yet still you can hear Alpha Steppa’s unique flavour – hypnotizing basslines and a lot of musical inspirations, especially these coming from East. Also one of the best musical discoveries of this album is – for me – the singing of I-Sarana in “The River”, so majestic and magic in conjuction with the powerful riddim with massive horns section! There are also many other interesting artists invited to this album: Cologne, Cyp, Kiangana, Ras Tinny, Wellette Seyon (beautiful “In The City”!). Now, let’s go forward to the dub versions on the “Grounded” vinyl. Here the bass and the rhythm come to the foreground. These tunes, which on the “Rooted” sounded so rootically and melodically, here are moved to a wild, raw dub killers with resonating bass and effects flying around your head. They are perfect illustration what the dub is, what can you do with the vibe of a tune when you know how to use all the sound and musical expression tools, all the dub techniques. An excellent album, for loud and perceptive hearing from the beginning to the end. And looking forward for Dub Dynasty’ next album, scheduled for this Spring! 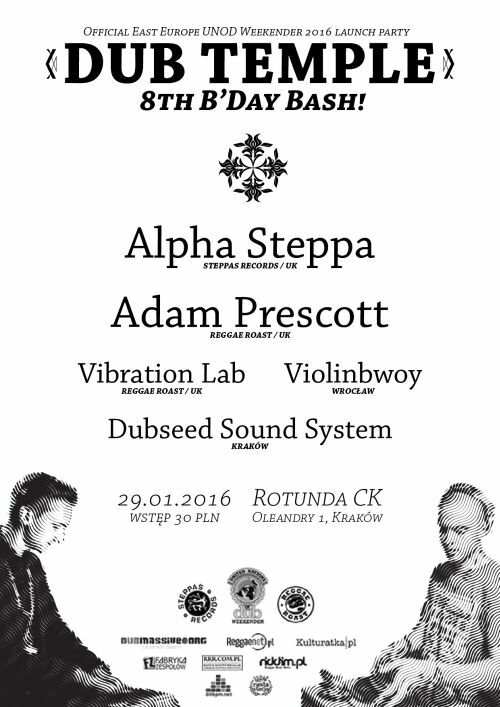 DUB TEMPLE 8th B’Day Bash! Official East Europe UNOD Weekender 2016 launch party. Czas płynie nieubłaganie, kluby znikają, publiczność się rozrasta, a my konsekwentnie staramy się comiesięcznym cyklem serwować Wam to co w światowym dubie najlepsze. Pomimo trudnego okresu jakim bezwątpienia jest zamknięcie Fabryki udało nam się „wziąć w garść” i na nadchodząca, będącą ósmą rocznicą cyklu sesje przygotować dla Was solidna muzyczną ucztę. W tym roku postanowiliśmy zorientować się na nową szkołę UK dub’u i zaprosić do nas artystów, którzy naszym zdaniem wprowadzają najwięcej świeżego powiewu w tamtejszą scenę i są obecnie lokomotywą rozwoju i podejścia „Forward thinking” czego wypadkową są świetne single/albumy w klimacie „future reggae/dub”, które rządzą zarówno w domowych głośnikach wszystkich szanujących się dubheads jak i na potężnych sound systemach czołowych imprez dub w Europie. Odwiedzi nas ekipa REGGAE ROAST z Londynu w reprezentacji: ADAM PRESCOTT i VIBRATION LAB oraz podbijający świat genialnymi albumami i singlami ALPHA STEPPA! Line up uzupełni nasz topowy rodzimy producent i multiinstrumentalista z Wrocławia VIOLINBWOY o którym również robi się głośno na świecie! Podobnie jak w zeszłym roku kontynuujemy partnerską kooperację z największym dubowym festiwalem na świecie: UNITED NATIONS OF DUB WEEKENDER 2016, którego będzie to tradycyjnie już oficjalne „launch” party na Europę wschodnią. Zapraszamy serdecznie i do zobaczenia 29.01 pod sound systemem! 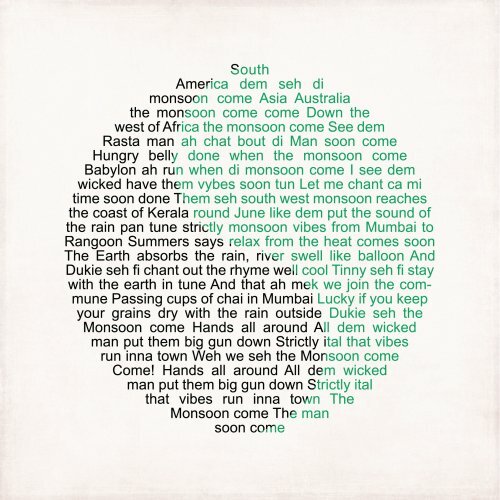 After having some troubles with neighbours Steppas Studio gives us next 12” with the retake of thundering “Monsoon Come”. The track remixed by Cranky General & Dutty Hands now get an excellent, rootical flavour a with a magic melodica flowing through the riddim. Previously played as a dubplate, now is available for everyone. On the B side we have a powerful track by Zentash Gigawatt, known from the previous Trigram release. A deep and tribal riddim carries serious, responsible message from Ras Tinny about contraception and his voice perfectly matches this vibe. 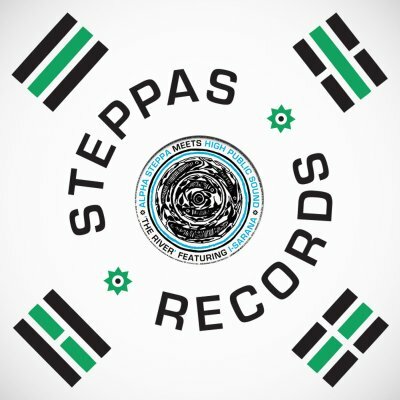 This is the second release with Zentash in Steppas Records and I’m definitely waiting for more! 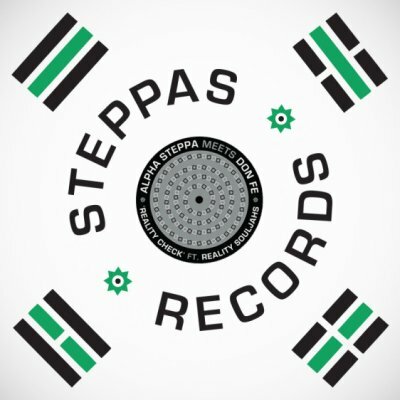 Don Fe returns to Steppas Records! Together with Alpha Steppa and vocal duo Reality Souljahs they take us to mystical dubwise valley. And each version will move you further and deeper, from dubwise to harderwise – 4th one is truly dangerous… Beautifully sounding tracks contains a lot of tasty dub space and – as usual – low frequencies will not let your bass speakers stay idle. 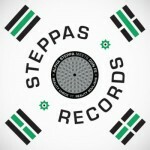 Check out Steppas Records webshop for 12” & downloads.